9.Due to the light and screen setting difference, the item's color may be slightly different from the pictures. The item will shipped by ePacket and it will need 7-15 business days to deliver. Beautiful Arcade Game Console with Original Pandora's Box 5S+ Motherboard! (pls feel free to contact us for game list). 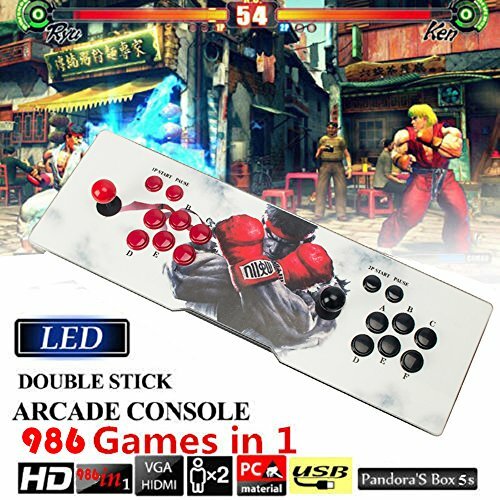 BUILT IN 986 GAMES: With built-in 986 classic arcade games, you are ready plug and play. No complicated connection needed. USB CONNECTOR- Connect this game console with computer or PS3 as a joystick to play the games in your computer or PS3. 2 PLAYERS GAMING: You can enjoy arcade games playing with your families or friends, having fun just so easy. If you have any questions about this product by STLY, contact us by completing and submitting the form below. If you are looking for a specif part number, please include it with your message.